At Latin, we have found that students are happiest with their choice of college when they have spent time discovering their interests, exploring a variety of possibilities and taking responsibility for the course of their application process. College counseling is a four-year process at Latin. With a staff of four, the program is as individualized as the rest of our curriculum. Our counselors work with students to match their interests and strengths with the best-fit schools.Each student’s college search is an opportunity to learn about one’s own educational and social needs and to develop decision-making tools that will help shape future choices both in and out of the world of academia. Ideally, applying to college is the conclusion of a Latin career that involves engagement in the classroom, an impassioned approach to learning, and a commitment to the life of our school, community and the world beyond Chicago. The staff of Latin’s College Counseling Office encourages students to be involved, reflective, and accountable for their choices. As the people who know their children best, parents also play an active role. We will work closely with each student and family to find a group of schools that best match (and build upon) the individual strengths, interests and achievements of an ever-evolving Latin student. Latin students attend some of the most diverse and reputable institutions in the United States and abroad; they seek schools that are both far afield and locally situated, small liberal arts colleges and large universities. Latin students are successful in the college application process and apply to a broad spectrum of schools. Ultimately, their choices reflect diligence, the strength of their academic preparation and self-exploration that are the hallmark and natural culmination of their Latin education. College Counseling at Latin begins formally at the end of the first semester of junior year but is an informal process that builds upon strong academic and personal advising that takes place throughout students’ high school career. In the freshman and sophomore years, students are encouraged to get involved in school activities, athletics and clubs to hone their own academic interests and artistic talents. The best foundation for a successful college process is the same foundation for a successful high school experience. Students are encouraged to enroll in a variety of appropriate courses that expand their minds and challenge their sensibilities and to join organizations that test them as citizens, competitors and leaders. Students will receive a variety of informal and formal testing advice at appropriate times throughout the first two years at Latin. In the fall of sophomore year, students will take the PSAT in order to familiarize all Latin students with the test format and to help students become aware of potential standardized-testing concerns. Beginning in the spring semester, all students will meet in group seminar classes with a college counselor, discussing a variety of issues related to the college search process. These classes will continue in the fall of senior year, when the tone will switch from informative and exploratory to one that is more administrative where we collectively tackle the actual business of applying to students’ schools. By the second half of the spring semester, juniors will meet individually with their college counselor in order to develop a relationship that eventually includes their parents in the conversation and planning. Latin’s college process is personal and individual, and counselors get to know each and every student. 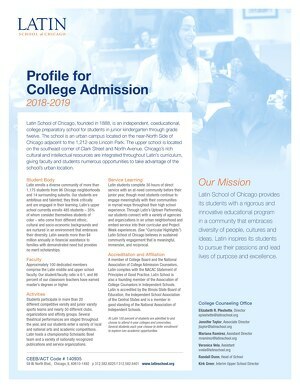 The staff is then prepared to offer tailored suggestions to students regarding their college choices, and professional and personal advocacy throughout the college application process. Latin counselors are the students’ advocates in the college process – they represent their interests to colleges, write lengthy letters of recommendation and ultimately offer wisdom and careful counsel to each member of the junior and senior classes. College counselors are available as advisers, editors, interview coaches and ambassadors to representatives from over one hundred college and universities. Latin’s college office provides information and guidance until each senior has made a decision to enroll in the school of his or her choice. It is our first priority to address the needs of each student, so the primary relationship is forged between each Latin student and the college counselors; however, we are also a resource for parents. Parents and guardians must know that they will be called upon to appropriately shepherd and support their children through the college process and should feel free to seek Latin’s counsel to help navigate the stressful and often confusing transition to college.